Jeff Southworth: Lead Guitar on "Kiss On My List"
Ralph Schuckett: Organ on "Everytime You Go Away"
Mike Klvana: Synthesizers on "Africa"
Hall & Oates are an American musical duo composed of Daryl Hall and John Oates. They achieved their greatest fame in the late 1970s and early to mid-1980s. Both sing and play instruments. They specialized in a fusion of rock and roll and rhythm and blues styles, which they dubbed "rock and soul." 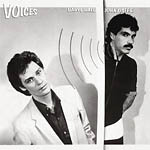 Voices is the title of the ninth studio album by Hall & Oates, released in 1980. The original LP album cover was in black & white and had several variations with the duo in different poses and the half circle, sound-like waves were embossed & raised; a marketing technique commonly used in late '70's record sleeve packaging. It was subsequently replaced in 1981 with a color photograph of the duo, excluding the original pose of Hall "escaping" from his white trench coat-like jacket. The album was re-released in 2004 as a remastered version with a slightly different cover photo but no additional tracks. The Japanese re-release version had two extra tracks:: "Kiss on My List" (Remix) and "Everytime You Go Away" (Remix).